I’ve written a book and it’s all about…yeah it’s about sandwiches. 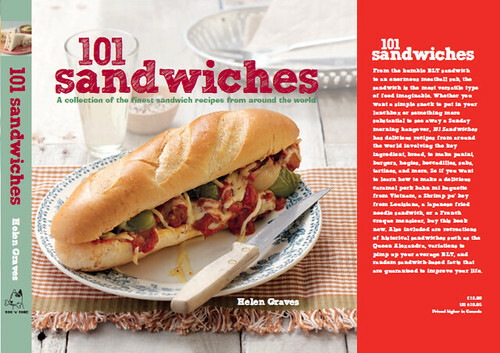 It’s called 101 Sandwiches and it contains the best sandwich recipes from around the world. It will be published by Dog n Bone Books in October 2013 and is available to pre order now through Amazon. My Main Company Imports The “Mollete” a 16th Century Recipe Olive oil Bread Imported from the Mountains of “Antequera” I will be Launching “The Olive oil Sandwich Company” to showcase The “Mollete” which for my opinion is the most amazing sandwich bread ever !! I have over 40 Mediterranean Recipes but have created “My London Recipes” Range for the occasion. I look to start at Brixton food Market but would welcome your feedback. Also It would be me pleasure to send you some samples of this trully amazing bread. I’m about to open a sandwich shop in Montpellier (France) and would be very interested in your bread – do you know if its available in France please? Hi, just ordered your book in Kindle format, thanks for writing it.